I feel like we got absolutely no winter here. Winters are usually unsatisfactory anyway (I want ALL THE SNOW and at LEAST a solid three months of icy temps, but I'm too far south in Missouri for that), but this time, we had a touch of ice, a few cold days, and that's it. I feel like Santa forgot to visit my house on Christmas Eve or something. I think the Spring temperatures are giving me Spring Fever, too. I'm restless. I want to clean all the things, start all the projects, finish all the projects, travel around the world, climb the walls.... And I'm in a weird mental place where I want to talk to people, but I also want to be completely alone. I was deep in the throes of this last night, and I solved it by talking to my dog. He's a good listener and low maintenance company, so it was perfect. 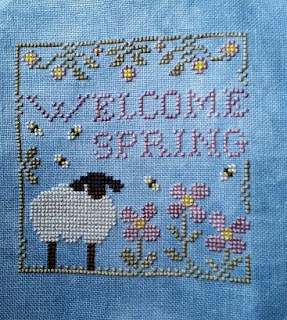 Welcome Spring is a 'free' chart by Little House Needleworks that came with the purchase of 3 Classic Colorworks colors. I stitched it on Dwarf Blue Belfast linen, which turned out to be a touch too dark for the thread colors. But it gives the design a "stormy Spring day" look, so that's ok.
And I finished the last of the Love Blocks, hooray! 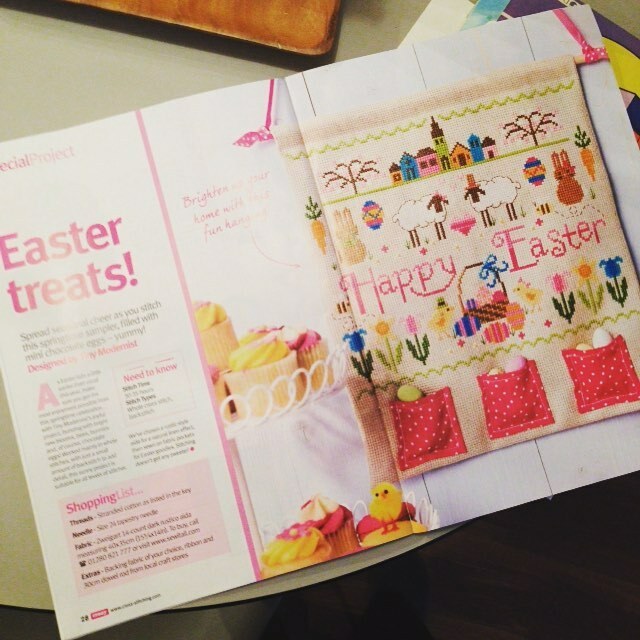 The designs are very cute and stitched up easily, but Spring Fever struck and I got bored. I finished the book I had brought with me ("Origins: Fourteen Billion Years of Cosmic Evolution" by Neil DeGrasse Tyson and Donald Goldsmith, which is GREAT), so I went to the bookstore and found "Relativity" by Albert Einstein and "Spooky Action at a Distance" by George Musser. "Relativity" is apparently Einstein's attempt to write "The Theory of Relativity for Dummies" back in the 1920s. :D It's not dumb enough for me, though, so I have been struggling with it. I switched to "Spooky Action" for a (haha) easier read. It's about a phenomenon that, basically, challenges the known laws of contemporary physics (i.e., the theory of relativity and quantum mechanics). The book has turned out to be a sort of mix of science philosophy and science history so far, and I'm really enjoying it. It's from Feb 2016 Cross Stitch Crazy, by Tiny Modernist. Since I'm stitching from stash, I've ended up using an opalescent light blue 32 count linen. I don't think I'll have to backstitch the sheep to make sure they'll show up, at any rate. Oh, also, here is a cat in a backpack. 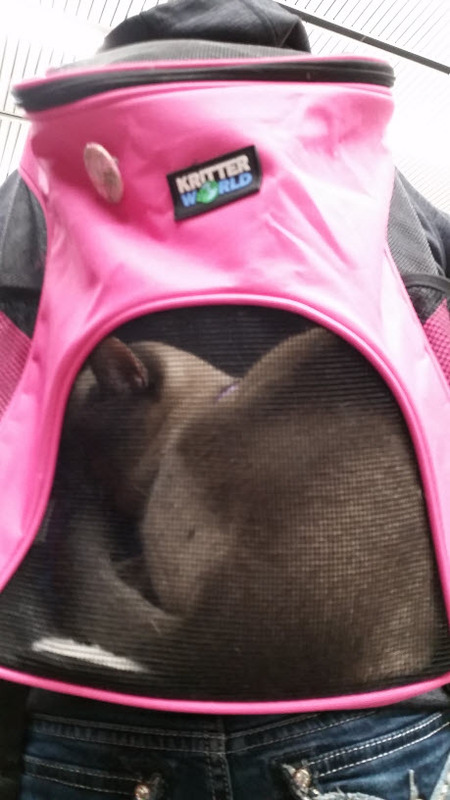 I saw him at the airport; his family was moving across country and this is how he traveled. Welcome Spring us gorgeous, I saw my first baby lamb if the year today when in the countryside...so cute. I agree with you about being robbed our winter. Your stitching is all fantastic. Congrats on the finishes. I just love the Love letters. Your new piece looks fantastic. Good luck with it. The cat is too cute. I really like your Welcome Spring piece and I LOVE the blue fabric. Way to go on finishing the Love blocks! I look forward to seeing progress on your new piece. I love your Welcome Spring on that blue fabric! I'm attracted to pale blues and lilacs when I buy fabric. We had the same kind of winter as you--non-existant! I hate to say it, but I did miss the snow! Love your LHN piece on the blue. I stitched it as a gift last year--need to do one for myself. Enjoy your March--spring is almost here weather we are ready or not! 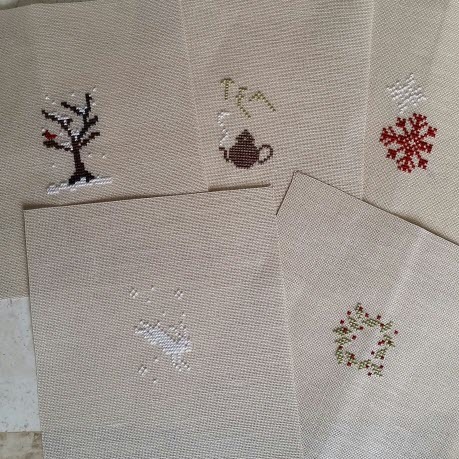 I don't know the first thing about stitching, but those seasonal images are lovely. So cute and tidy. 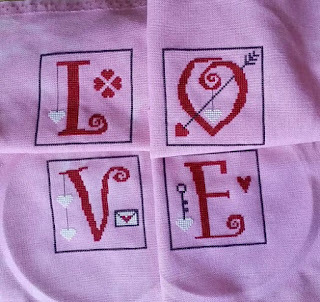 This is from a kit that came with an issue of Cross Stitch Crazy magazine. 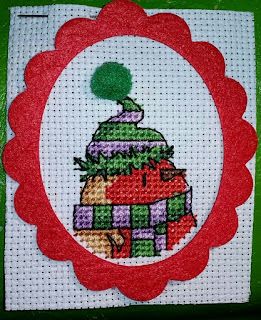 It will be finished into an ornament using the little felt frame that came with the kit. There are supposed to be little stars/snowflakes, but this fabric about drove me nuts with how hard it was to stitch on, so I left them off. It's a foam wreath wrapped with a color-blocked yarn. I made the felt flowers, added a couple cute berry picks and some jingle bells, and got the bow at Michaels. I'm really happy with how it turned out. My first small for the 2017 Smalls SAL run by Heather of Stitching Lotus. It's a Lizzie Kate Tiny Tidings called Snow Bird. 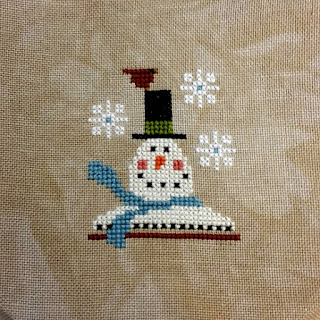 There are meant to be blue beads in the centers of the snowflakes, but I subbed blue stitches. Stitched on 32 count linen in "Wren" by PTP (I think). I had intended to have one or two other smalls done by now, but for some reason, I thought it would be a great idea to start a project on January 2 for a friend whose birthday is February 3. I've had to put everything else aside to work on it. I still have 1/4 of it left to do, and only a week to do it. :( I really like it, and it's going to be cute when it's done, but ack. 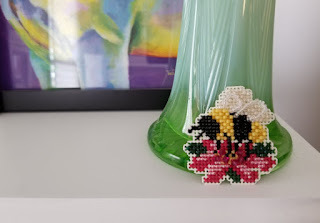 My monthly post for the Smalls SAL, this year hosted by Mary at Mary's Thread.